It’s almost officially summer, and that of course means more beautiful weather, lots of tourists, plenty of recreational options, and outdoor movies. 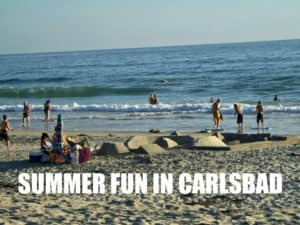 Carlsbad Village will once again host the free Flicks at the Fountain outdoor movie series on 6 successive Thursday nights, beginning July 5 and through August 9.This series is sponsored by the Carlsbad Village Association, among other businesses. Flicks at the Fountain takes place by the Carlsbad Village fountain near the parking lot, at the corner of State Street and Grand Avenue. You can start getting settled at 6 PM and the movies begin around dusk (a little after 8 PM in July, and around 7:45 in August). Be sure to bring along blankets (you know how it can get chilly in our summer evenings close to the beach), low-backed chairs and food/snacks to enjoy. Another al fresco dining option is to stop by one of the many local restaurants and vendors in the area, for a take out meal.